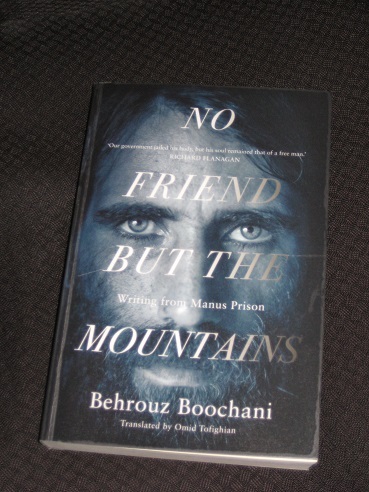 Behrouz Boochani’s No Friend but the Mountains: Writing from Manus Prison (translated by Omid Tofighian) is a work describing the writer’s time in the euphemistically named Manus Island Regional Processing Centre, a natural development in Australia’s plan to stop refugees arriving in the country by boat. After initially excising its external territories from Australian soil for immigration purposes, the country then paid poor neighbours such as Nauru and Papua New Guinea for the use of their land as holding stations for ‘illegal’ arrivals. One of the most notorious of these processing centres, on PNG’s Manus Island, was in operation for several years until it was finally shut down in 2017. This was by no means the end of the story, though. While no longer in the prison, most of its former prisoners are still on the island, not knowing when, or if, they’ll be able to leave. No Friend but the Mountains is a book with an amazing back-story. Boochani wrote it on Manus Island under the noses of the authorities, using a mobile phone to send texts and WhatsApp messages to his friends, who then translated and helped edit the result. Once a book deal was found and the work was published, it was entered for the Victorian Prize for Literature, and won, having been exempted from certain eligibility criteria – such as being written by an Australian. The deal is that we have to be a warning, a lesson for people who want to seek protection in Australia. Of course, this is most effective if it can all be done thousands of miles away from pesky journalists and lawyers. What the people don’t know won’t upset them. Part of the description of life in the camp focuses on how to cope with the constraints of months in a cramped, squalid enclosure, and Boochani describes some of his fellow inmates who stand out for their unique methods of getting by. One is Maysam the Whore, an extravagant extrovert who puts on nightly shows, driving the men into a frenzy with his dancing and costumes. Another is nicknamed The Cow, an overweight man who always manages to get to the front of the meal queues, his day revolving around his stomach. Not everyone is quite as charismatic as these two, but the writer introduces us to a host of characters, each with their own distinctive features and ways of making it through the long, hot days. When added to the deliberate lack of food, disgusting toilets and failing generators (in a tropical climate), these controlled stresses gradually cause people to fall apart. It’s no surprise that the book builds towards a violent and tragic conclusion. These poetic interludes help to break up the fairly long chapters, showing us that on the inside Boochani isn’t always as stoic as he may appear. In addition to his translation work, Tofighian contributes an introduction and closing essay, helping to set the scene and also explain the idea of Kyriarchy. He explains how Boochani didn’t really set out to write a factual account of his ordeal, instead wanting to engage philosophically and psychologically with what Manus really is. At times, this means the book does have its flat spots, both in terms of content and writing; however, for the most part No Friend but the Mountains is gripping, informative and occasionally chilling. Boochani’s account of his time in the prison is a disturbing book in many ways, with accounts of self-harming and brutal violence, but it’s an important one, too. It shows what Australia’s obsession with ‘protecting our borders’ actually means, with a government desperate to hide what’s going on, determined to silence any voices from Manus (as several laws preventing doctors and journalists from reporting what they know show…). No Friend but the Mountains doesn’t always make for pleasant reading, but it’s nevertheless a story that should be shouted out across the country. This is who we are – and it’s damned ugly. oh wow, quite an eye opener, thanks!! Emma – It’s certainly strong stuff.